Mellow Mushroon in Jacksonville Beach does not have a gluten free menu, but I ate gluten free at their restaurant. It was my sister in law’s birthday celebration with our family and they wanted to eat someplace fun, affordable and delicious. I am not going to deny, I love Mellow Mushroom’s pizza and the atmosphere is very fun and casual. 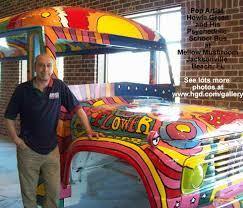 It is especially great for my nephews 2 and 4 because of the cool seating inside their groovy bus in the dining room. Ok, I know you are dying to know how I ate gluten free. I brought my own pizza! I called around 4:30 to ask for permission and was told the manager would call me back with an answer. I didn’t hear back and thought, what the heck, I am going to bring my own Glutino Duo Cheese and Spinach and Feta cheese personal pizzas with my fingers crossed they would cook them in their oven for me. As soon as I walked in with the pizzas in my hand our waitress happily took the pizzas from me and said they would come out with the rest of the table’s meals. They were more than accomodating and glad to help me out. I was so glad I took the risk and brought them with me. I am fine with eating before going to a restaurant that is not gluten friendly, but the last time we ate out for pizza I was craving it big time and it was turture. When the pizza came out at Mellow Mushroom Jax Beach, it was the best tasting frozen gluten free pizza I have ever had. I don’t know if it is their ovens or that I was hungry but it was so yummy; I didn’t feel like I was missing out on pizza night with my family. When we left I was informed that they are planning to have a gluten free menu in the near future. I am excited to hear more about it and hopefully try out the new menu soon. *please note, Mellow Mushroom added a gluten-free pizza to their menu a few months after this post. An updated post will be coming soon! Mellow Mushroom will have Gluten-Free pizzas starting in June. I am the marketing director and I am building the gluten-free campaign now. I am interested to learn what local sources you look toward to find gluten-free products. Pretty soon you can have a real Mellow pie without bringing it to the restaurant yourself! Thanks Jon! I am so excited that you will be having gluten free pizza soon. I really haven’t found any dough that I particularly like without having to doctor it up with garlic, oil and salt, most are pretty bland. I typically get it from Whole Foods, but I know Tommy’s Pizza on the southside has their gluten free dough shipped in (can’t remember what brand they use). Some of the trusted brands I like are Bob’s Red Mill and Glutino. One of the challenges will be the cross contamination issue, will you have a designated area where the gluten free pizza will be prepared? Will you be getting gluten free beer too? Budweiser’s RedBridge Ale should be pretty easy to come by through your distributor. I’ll be interested to know what you think. Still Riding makes our gluten-free dough exclusively for Mellow Mushroom with bean, rice and tapioca flour, starch, yeast and egg. Our cooks have been receiving extensive training on cross-contamination for months now and the kitchen has a gluten-free station. We are looking into gluten-free beers and vodkas currently. What local websites and blogs do you watch to learn about new places offering gluten-free products? Wow! That is impressive! Some of the sites you definitely need to get noticed on are UrbanSpoon.com, they do a gluten free ranking of Jacksonville Restaurants; GlutenFreeRegistry.com and I would also recommending adding a section on your website about your gluten free menu. A lot of times I just do a search by typing in Gluten Free and the restaurant’s name and that helps me decide where I am going to eat. I just ate dinner at the Mellow Mushroom and had the gluten free pizza and it was WONDERFUL. I still prefer thicker crusts, but this pizza was good. I could put any of the toppings listed from the House pizza on it, so I was able to order the type of pizza I like. It’s wonderful being able to just go out and get a pizza and not have to make it myself. They also have salads that you can customize and that was super nice! Thank you so much for having the gluten free pizzas available Mellow Mushroom! Could you work on getting some gluten free dessert options, next, please? Tommy’s uses Still Riding crusts. Maybe a different formula? They are a little too “beany” tasting for my tastes, but at least it is Pizza. Boston’s up by the Jax airport also has a gluten free crust that is more rice like but kind of delicate. Thanks Dave! I have not been to Boston’s I will have to give it a try. Hope you like it. I think it is only thing Boston’s has that is Gluten free. Tommy’s also has some cookies that are gluten free. That is music to my ears! Ever since my diagnosis (at age 30, 2 years ago) my friends and I have stopped going out to your restaurant because of my diet restrictions. We will be back! At Tommy’s we carry Still Riding crust for our pizzas. We have had them available for over a year and a half now. As the demand and awareness increased, I have added GF brownies and cookies to our dessert menu also. Our cheesecake has always been gluten free, and as are our salad dressings. For the past year a majority of our homemade soups are GF as well. I try to keep as much of our products as safe as possible, so everyone can eat. Thanks for your support! Thank you Tommy! I am a frequent customer to Tommy’s and often bring those without Celiac to dine with me and they love it (however, my boyfriend complains the pizzas are a little small and we usually get a few side items). I was there one day when you were out of the Still Riding pizza crust and one of your employees gave me some of your gluten free cookies because he felt bad. They were AWESOME! I have also had your gluten free Cheese cake and that is awesome too. The crust that Still Riding Pizza developed with Mellow Mushroom chefs is a recipe available exclusively at Mellow Mushroom. It is designed to taste the most like our regular spring water crust. We also have gluten-free salad dressings, pizza toppings, and appetizer (as well as vegetarian and vegan options). We have just introduced Bard beer, a gluten-free beer that goes great with our pizza, and will soon be adding a gluten-free vodka to our bar offerings. I think it’s great that places like Tommy’s and Mellow are aware of this need in our community and hope it continues to build a trend that provides increasing variety and value to sufferers of Celiac as well as other food allergies. The Fleming Island Mellow Mushroom has GF pizza and it is to freaking die for. I’ve been twice in the last month since finding out they had it.